This a lay persons guide to terms and concepts used to describe and discuss development and land use issues. For a copy, download here (Development Terms Glossary, WEN, 24-June-2011). How is Land Use regulated? Consultation with the community allows the City to determine the opportunities in the community, as well as the needs, and the best ways to fulfill those needs. Does the West End have an existing Community Plan? The last comprehensive planning process in the West End took place between 1985 and 1987, with zoning changes following in 1989. The result was called the West End Policy Plan but it was never adopted by City Council as an “Official Community Plan.” Rather, the zoning changes made were implemented as a way to ensure the objectives of the plan were followed. Zoning is used by local governments to define permitted uses of land based on the idea of separating different types of land uses from each other – for example, don’t allow the heavy industrial use to be located next to the apartment building, or vice versa. Zoning may also regulate density, building height, lot coverage, and similar characteristics, or some combination of these, and in Vancouver and the West End, these types of regulations are part of the zoning for West End properties. Zoning does not regulate tenure (rental or owner-occupancy). What is the existing West End Zoning? The provisions of these zones are similar except with regard to the density permitted on the sites regulated by these zones. Density is a measure of development intensity on a lot. 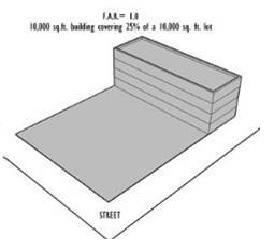 The more floor area of a building, the greater density. A tall slim tower might be equally “dense” to a short fat low-rise building, so density can be expressed in different ways on a property. 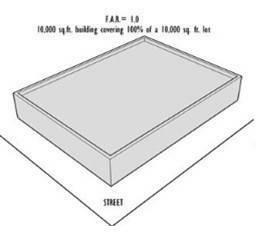 Zoning sets limits on how much density – how much floor area – can be placed on a lot. Increasing the density normally requires a rezoning of the property. Density is normally measured by a term called Floor Space Ratio or FSR. A higher FSR means that there is more floor area permitted on the site. A 10,000 square foot lot with a permitted FSR of 1.0 would allow for the creation of 10,000 square feet of floor area on the lot. An FSR of 2.75 would allow the creation of 27,500 square feet of floor area on the lot. Each of these diagrams show an FSR of 1.0 – the density is simply “piled” differently on the lot. City Staff regulate development and administer the Zoning Bylaw – their job is ensure that proposed development complies with existing zoning. If the development does not comply, the land owner has a legal right to apply for a rezoning. City Council makes the final ruling on establishing zoning and changing it – these decisions are based on recommendations from the Planning Department. The West End has a set of “Development Guidelines” to accompany the RM-5 Zoning. Guidelines are by nature subjective and are used to evaluate development in conjunction with the appropriate zoning. While zoning is the law, guidelines are policy and provide guidance to achieve certain objectives. Guidelines typically deal with issues such as character and design, and can include building finishes or architectural styles. In the West End, the guidelines reference the required separations for tall buildings, the need to preserve privacy, and the importance of attractive landscaped streetscapes. Where is the Property Line? Many people think of the edge of the sidewalk as representing the property line of an adjacent parcel. The property line in the West End is normally about 6 feet away from the inside edge of the sidewalk. What this means is that the lawn or landscaping for the first 6 feet from the sidewalk toward a building is public property. 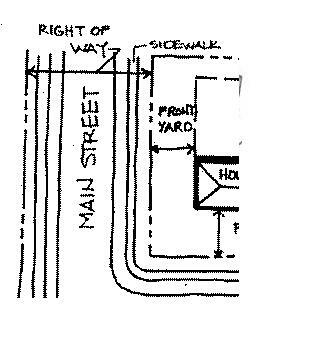 The diagram shows a typical relationship of the road right of way (public property), the sidewalk (public property), and the private property adjacent. Existing zoning in the West End indicates the distance that buildings are to be located away from property lines. For “front yard” setbacks, the typical distance is just over 12 feet. For “side yard” setbacks the typical distance is 6.9 feet. Setbacks are measured from the property line, not from the sidewalk. Developments proposed with smaller setbacks have the likelihood of reducing the landscaped character of the West End. The existing pattern of lawns and landscaping helps to lessen the visual impacts of buildings. Locating buildings closer to the property line and to the sidewalk (by reducing setbacks), will result in a reduction in landscaped areas and increase this visual impact. What are DCL’s – Development Cost Levies? The DCL is a charge on new developments to help pay for growth-related needs such as parks, transportation, community services and childcare. Current rates for the West End are just over $10 per square foot for new development. What is a CAC – Community Amenity Contribution? The CAC is defined as: A monetary or in-kind charge on additional density which has been approved by City Council through a rezoning. CAC’s can be used to secure a wider variety of amenities than DCLs and the CAC’s are typically negotiated by the City based on the increase in land value to be expected on a development site – the City’s aim is to collect approximately 75% of the increase in land value arising from the rezoning. The CAC is generally assumed to be “zero” on proposals for rental housing because the City deems the rental housing to be a contribution to the community and a type of development that has a zero increase in land value associated with it.